The garbage disposal is a luxury enjoyed by many Americans. It makes cleaning up dishes faster and eliminates the need for a trash bin inside the house for organic waste. While a garbage disposal may be convenient, there are a lot of things that shouldn’t be put down there. The average garbage disposal is intended to shred food waste so that so it doesn’t clog your pipes. One rule of thumb for effective garbage disposal use is to avoid grinding anything that is not 100 percent biodegradable. However, it is important to note that not all organic materials should be put down your disposal. Cooked Meat Scraps. Food scraps, such as pieces of cooked meat, from your meal are fine to add to the garbage disposal. Just get rid of the big chunks before you run your system. Leftover or Rotten Fruit. Old fruit can go down the garbage disposal without a problem. Citrus Rinds. Peels from citrus fruits can clean up your garbage disposal and help leave the drain smelling very fresh. Veggie Scraps. Most vegetable scraps can be run through your disposal, but avoid the hard and fibrous types such as celery, pumpkin, and asparagus to be on the safe side. Bones. Garbage disposals are not made to grind up bones. The bones will just chip into sharp pieces and whirl around the disposal area when the blades move. Even chicken bones may damage the garbage disposal. Instead, toss them in the trash or your compost pile. Don’t worry if the occasional small – very small – bone gets down your disposal, but as a general rule, bones and disposals don’t mix. Broken Glass. This is an absolute no. Broken glass will destroy the garbage disposal and can cause a permanent blockage in the pipes and drains. Crustacean Shells. Lobster, crab, oyster, clam and other calcium-based shells are a big no-no. They can be hard to grind, and they can leave a foul odor in the garbage disposal. Banana Peels. 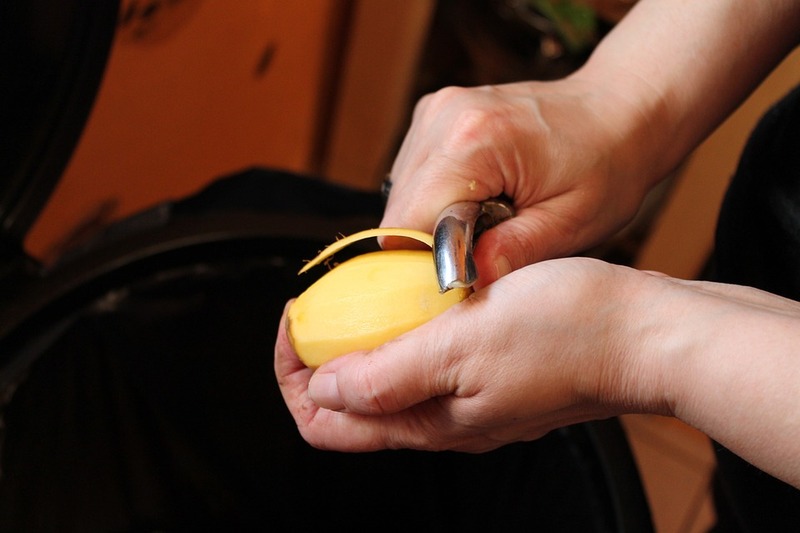 Banana peels are very stringy and tough, so don’t throw them in your disposal. Toss them in the compost or trash instead. Grease. Grease eventually hardens and congests the drain and pipes. It also accumulates over time and causes a lot of damage. It is best to let the grease solidify in another container and then scrape it out into the trash. Paint. Paint also hardens over time. It may go down quickly in its liquid state, but once it dries and hardens, it can cause blockages in the pipes. Chemicals and corrosive substances. It’s a poor idea to pour chemicals and corrosive materials down the garbage disposal. This can eat away at the pipes and drains. Chemicals can also find their way down into the sewers. Remember that hazardous substances like these should be properly disposed of according to the manufacturer’s instructions. Use discretion when you toss biodegradable and non-biodegradable substances down your garbage disposal. Even if you don’t see any immediate harm to your system, chucking some of the items in the “don’t” list down your disposal could wreak havoc on your system in the long run. Given how costly disposals can be to repair, it’s worth it to place things in the garbage can if you think they will not mix well with your disposal.